Emily Bozeman Mixon has been involved in Arts and Crafts for over 40 years. She attended many crafts shows as a participant for over 15 years traveling from Tennessee to as far away as Michigan to sell her wares. She managed two craft supplies stores for a craft supply company located in Memphis, Tennessee. In 1992 Emily began teaching arts & crafts on cruise ships for Costa, Cunard, Celebrity and Holland America and has been doing so ever since. She has taught many classes with 100 or more people in attendance and others with 25-35 people in attendance. Michael Hick was born and educated in England. As a young school-boy he was taken all over Europe with his parents who were on post-war business in the war-torn continent. Michael graduated in History, Geography and English Literature and then joined the Royal Navy serving throughout the Mediterranean, the Baltic and the West Indies. Then, during a long career at Lloyd�s of London, he traveled world-wide doing business in most countries. Following a successful global business career Michael became a Professional Speaker for business audiences and has won numerous speaking awards. 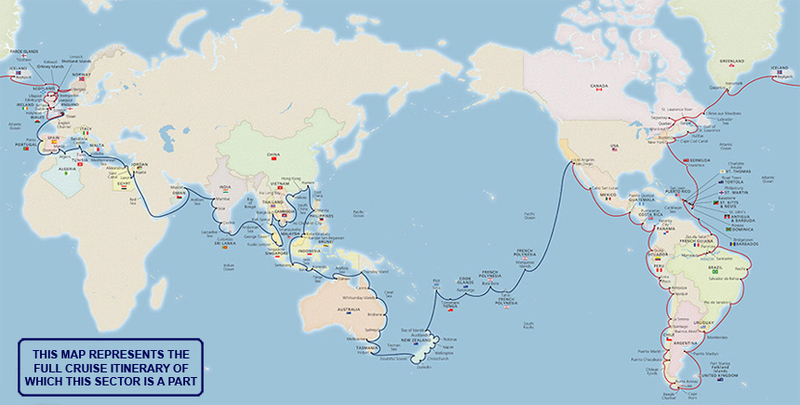 Since 2005 he has worked with almost every cruise line specializing in destination history talks. Snyder was a diplomat with the U.S. State Department Foreign Service for thirty years. He served in Thailand, Iran, Taiwan, Malaysia and Austria, as well as in Washington. Among his positions was Director of the State Department Press Office and Spokesman, when he often delivered a televised daily briefing with reporters, and Deputy U.S. Ambassador to the International Atomic Energy Agency in Vienna, where he directed work on nuclear issues in North Korea, Iran and Iraq. For the past nine years he has been a destination and special interest lecturer on cruise ships, private jet tours and Smithsonian Journeys land tours. Sir Andrew Burns is a retired British Diplomat with extensive experience of South and SE Asia and China/Hong Kong, Israel and the Middle East, Central and Eastern Europe, the US and Canada. His final post was as High Commissioner to Canada, having previously been Ambassador to Israel and Consul-General in Hong Kong and Macau. Sir Andrew lectures on historical, cultural and foreign policy subjects in a tailor-made way that illuminates the geographic region of each cruise and draws on his own experiences as a diplomat with an eye for the humorous. Jean was born and raised within the sound of Bow Bell�s in East London where her family have been for almost two hundred years. She has spent most of her working life as a nurse in the East End of London, first as a Sister in charge of a team, and then as a District Nurse tutor. She started writing ten years ago and enjoys all eras of history but is fascinated by the 18th and 19th century and many of her books have been set in this period. As an experienced ship destination lecturer and historian, Dave draws on a rich background including teaching, engineering, military service, corporate business and consulting. Dave weaves stories about history from his travel insights, research, experiences and knowledge. History is not just about dates and facts but about people, relationships and life stories. Dave tells their stories with a unique style blending travel experiences to over 130 countries, creative narratives, humor, and engaging trivia (he was even a four time champion on the TV program �Jeopardy�). Air Commodore Andrew Lambert flew Phantoms and went on to run the RAF's "Top Gun"� school. A planner for the 1991 Gulf War, he then commanded a Tornado fighter squadron on operations over Bosnia. As an Air Commodore he commanded in the Falklands and the Iraqi Northern No Fly Zone. A Military Historian, he has also published a number of papers on the Psychological Impact of Air Power and Coercion and British Defence Policy. Ronnie Landau is both a Classicist and modern European historian. A widely published author, his books are used extensively throughout the British and American university systems. His illuminating lectures on Graeco-Roman civilisation and the History of Israel are authoritative and thought-provoking, yet his style is relaxed, accessible and full of humour. He can also offer �enrichment� sessions on a variety of topics, including The Seven Deadly Sins, on which he has written an amusing book. Dr. Caroline Malloy is a freelance educator and scholar based in Chicago, IL. She earned her Ph.D. in Art History at the University of Wisconsin-Madison. She has taught Humanities and History at both Villanova University and the School of the Art Institute of Chicago. Other academic ventures have included working on an archaeological dig in Italy and reviving the Latin language at an independent Academy in Philadelphia. Dr. Malloy has been invited to deliver lectures on Empires, Nationalisms, and Heritage Projects throughout the US and Europe to both professional and public audiences. She is a specialist in both the British Empire and Ancient Rome. Sandra Millikin is an American who has lived in England for over 40 years. She was educated at Smith College, Northampton, Massachusetts, USA and at the Courtauld Institute in London where she studied under the famous English architectural historian Sir John Summerson. She was assistant Curator at the Royal Institute of British Architects Drawings collection, where she contributed to the catalogue of the collection which is now housed in the Victoria and Albert Museum in London. Sandra has given talks on architectural history world wide on cruise ships and particularly enjoys days at sea as she is also a keen bridge player. She has also acted as Bridge Director on cruises. Robin has been involved with the study and conservation of whales, dolphins and the marine environment for nearly 25 years. He now shares his wide knowledge and experience with cruise ship passengers in lively and informative lectures with stunning photographs and video. His experience as an educator enables him to adapt his talks to suit audiences of all types and age ranges. On some cruises, Robin's interest in Seals and Seabirds, Pirates and Privateers and Nautical Sayings and Superstitions adds an extra dimension to his talks. Bruce Petty was born and grew up in Long Beach, California. He enlisted in the U.S. Naval Reserves at Alameda Naval Air Station in 1962, while still in high school. After graduation from high school, he served two years aboard USS Yorktown, CVS-10, as an aviation ordnanceman, and is a Vietnam War veteran. He graduated from the University of California at Santa Barbara, with a degree in history. In 1995, he moved to Saipan in the Mariana Islands, returning to California in 2000. Bruce is an accomplished author and now lives in New Zealand. Bruce is a regular speaker on cruise ships. Gavin has been in the shipping industry for 45 years, and in this time has seen remarkable changes in one of the few industries that operate regardless of national boundaries. Over the years he has been in many senior positions and in between times he runs his own maritime consultancy firm. Gavin also works with the Northern Maritime University in Northern Europe promoting new thinking in maritime education. His talks on how shipping affects us will surprise and entertain you. For over 30 years, John Rossi, a professor at the prestigious New York University has educated and inspired numerous audiences on subjects ranging from South America, Europe and the Pacific Northwest to technology and finance. An aficionado of world history, Professor Rossi�s interest was ignited on his first cruise to Alaska. Since then he has delivered enrichment lectures around the world with numerous cruise lines. In a friendly and informal atmosphere, John encourages audience participation, including his trivia questions about famous figures and historic sites. Roy Short is a retired Senior Manager of Deloitte Consulting who has spent the past thirty years studying and teaching genealogy. Upon retirement from corporate consulting he launched "Short On Time", a Professional Genealogy practice and has conducted seminars and workshops on a wide range of family search topics. Since then, his passion for motion pictures has prompted him to create a portfolio of "Tribute" modules which explore and explain different aspects of movie making, stars and genres. He now spends most of his time entertaining and educating cruise passengers in both Hollywood and Genealogy. Professor Chris Stringer has worked at The Natural History Museum London since 1973, and is now Research Leader in Human Origins and a Fellow of the Royal Society. His early research was on the relationship of Neanderthals and early modern humans in Europe, but through his work on the �Recent African Origin� theory of modern human origins, he now collaborates with archaeologists, dating specialists, and geneticists in attempting to reconstruct the evolution of modern humans globally. He has excavated at sites in Britain and abroad, and he is currently co-directing the Pathways to Ancient Britain project, funded by the Calleva Foundation. William Thayer received his BS in Math from Stanford, an MS in Aerospace Engineering from USC and an MBA from USC. He has spent 30 years in the aerospace industry in aircraft, missiles and spacecraft and 10 years in real estate/finance. Although he has a technical/financial background, history has always been his passion. He enjoys lecturing on great human accomplishments and great historical events. William enhances his historical experience by actually traveling to where history happened. He has visited all 7 continents, over 60 countries and been around the world 3 times. John has worked 45 years in Hollywood, including the production of nearly 40 documentaries, commercials and 7 feature films as producer/director/writer and editor. He has worked at the major Hollywood studios, and directed many well-known stars. As a stand up comedian, John peppers his movie presentations with his trademark, easy-going and unassuming observational humor. Unlike other speakers who just talk about movies, John is an actual movie maker who can authoritatively answer audience questions, and provide honest answers along with real world illustrations and examples.